Long time stylist and salon owner, Jeffrey Hall never understood why hair dryers are shaped like guns. Noting that their form is actually at odds with their function causing wrist, shoulder, and even neck pain, Jeffrey decided to take matters into his own hands. With the creation of AirPhysics, Jeffrey has given the everyday hair dryer a complete makeover. This patented hands-free blow dryer rests on any hard surface and activates with the touch of a button leaving both your hands free to comb, brush and style your hair while it dries. Unlike traditional hair dryers, AirPhysics directs airflow upwards for maximum volume and body. You don’t have to pick it up, but should you choose to do so, the lightweight ergonomic design is a pleasure to hold. 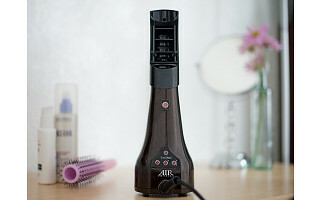 This hands-free hair dryer was created in order to prevent the painful wrist, shoulder, and neck injuries that have been attributed to traditional gun-type hair dryers. We originally created this hands-free method of drying for use in our own salon, and we're thrilled to be able to offer it to all of you for use in your own home. Please feel free to ask any questions - we're an open book! I am wondering the wattage of this uniquely designed blow dryer? That is always an important detail when I purchase a blow dryer. Also, how many settings does it have? 1500 watt Roxanne it is the heat and direct airflow that speeds drying time, volume,body and shine. You and I have been told to blast our hair dry. That is not the case…to beautiful hair. Thank you! I have very thick, curly hair that I blow out until it's practically straight, about 40 minutes, then I flat iron it. Is this blow dryer strong (and hot) enough for this type of hair drying? Great question. I have thick and curly hair as well and I have found that this dryer is strong enough and hot enough to get the job done. It takes me about 25 minutes to dry my hair but the nice thing about Airphysics is I do not have to be holding the dryer the entire time, which makes a huge difference. Hope this helps. Thanks Meredith! Also with the Finisher attachment you can straighten hair because of heat and the direct airflow to your brush. Keep firm tension with brush and let the finisher do the work. I have short hair, so I'm wondering how this would work for me. I'm looking for lift at the top of my head. Perhaps the only advantage in the weight. How much does it weigh? Short, Medium or Long deciding what works for you… NO attachment might be the answer... using the accelerator I would recommend for short hair or no attachment at all. AirPhysics is design with a heat shield if you do not use one of the attachments,,,,no more burns to the scalp. I, too, have short hair that needs lift on time. Also very fine hair. Am I correct in understanding that this would be easier on my hair yet terrific for lift? Also, I have a small pup I shampoo and dry....is it quiet? You mentioned heat shield in dryer....so no burns for me or pup? The dryer will not get hot...it has 2 heat shields but.... the attachments will so use a towel if hot or let cool before changing out. With you pup? If he or she is ok with your dryer now I'm sure it will be fine. We have Wally and he doesn't mind. I'm tall and would like to have something that doesn't make me bend over at a weird angle.... is the air flow chamber extendable or would I have to put it on top of something else to get it high enough for me? Hi! Your counter, stool or floor... You can flip your hair over and dry it hands free. Everyone is different the way they dry hair. So I would do what works for you. I tall too! Lisa sorry to hear that…hope the best for you and thank you for your suggestion. I will look into it. AirPhysics meets many needs for men, women, children and pets. Hello does the dryer come with a travel case for packing? Can I get it in any other color besides black? I always find lighter colored appliances don't hold heat and I'm concerned as to how long this takes to cool down to put away. Barbara.. I use it professionally at the salon everyday… you will be happy! DC motors are light in weight the cool button is cool not cold. AC motors are heavy weight dryers and will cool cold. But... neck pain etc…. is the dryer stable? I worry it would skitter around and tip over. No! AirPhysics is balanced and has 4 rubber feet for stability. (no vibrating off the counter) 4" inch base also for stability. Thank you! I have RA and have trouble using my hands this is what I've been looking for. My husband won't have to help me anymore. Wonderful Sharon! Thank you for sharing! Does the AirPhysics hair dryer come with a warranty? Although this product is a great concept and will definitely help people who have some debilitating problems, I do have to rebut some of your comments about what it will do for the average person. I agree that ionic dryers have been marketed as the end all beat all, but the reality of it is that on very thick, unruly, hard to dry hair, ionic dryers perform better and dry hair faster up to 10-15 minutes faster. Fine hair has a tendency with ionic dryers to get frizzy because it dries too fast. The other issue I have with your concept is that this dryer creates better volume, body and shine. We as professionals know that drying from the inside out with lift for volume cannot be achieved if the ends are dried first. Also, drying the hair with the airflow going with the grain of the cuticle creates shine. This dryer blows upwards against the grain which can cause the cuticle to raise and loss of shine and frizziness will occur. I love the idea of this dryer for the persons with the inability to hold a dryer traditionally and also the straight, lightweight design, but it still needs to be hand held to get salon finished hair. Amy from The Grommet team here. Thanks for your feedback. We hold this conversation board every day because we truly value what our community has to say about our Grommets so we appreciate you chiming in. Jeffery is definitely the person to respond as he's the professional and will be able to best address any concerns you have. I'll be sure he posts an answer as soon as possible. Thanks again. Thank you for your comments. As a Salon owner educator and now inventor I understand your concerns with how AirPhysics works. AirPhysics has 2 attachments: Accelerator for direct airflow at root area to ends for volume. The Finisher has direct airflow around brush 360 degrees for straightening or for curl to keep hair smooth and shinny. You as a stylist and myself can use ionic without burning hair. The average person has a tendency to not keep dryer moving with brush..... as you stated.. with the grain. As you see in the video with our model, she is using AirPhysics to get moisture out of her hair first and then use one of the attachments to finish her look for volume,shine and body. AirPhysics is designed for hands free and direct contact as hand held dryers. Long time stylist and salon owner, Jeffrey Hall never understood why hair dryers are shaped like guns. Noting that their form is actually at odds with their function causing wrist, shoulder, and even neck pain, Jeffrey decided to take matters into his own hands. 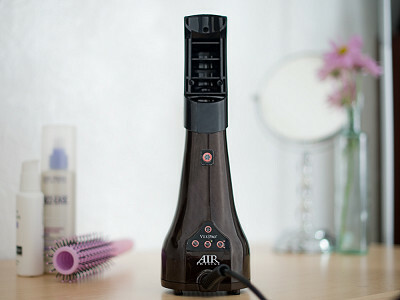 With the creation of AirPhysics, Jeffrey has given the everyday hair dryer a complete makeover. This patented hands-free blow dryer rests on any hard surface and activates with the touch of a button leaving both your hands free to comb, brush and style your hair while it dries.